Review written by Ashir, a 6th grade student. Date of review: October 2009.
Review: Are you a fan of books with action and adventure? If you are then you will enjoy The 39 Clues: The Sword Thief by Peter Lerangis. It is the fourth book in The 39 Clues series. The main characters in this series are Dan who is 11 and has an amazing memory, and Amy, 14, who is very intelligent. 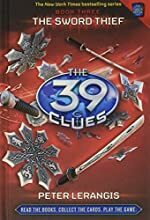 Dan and Amy find themselves in Japan looking for the fourth clue in their search for the 39 clues which their grandmother has prepared them for. The choice was theirs: they could have taken $1 million and left, which most others did but Dan, Amy and a few others took the deadly challenge. In Japan they are with their uncle Alistair and have made an alliance with him because he helped them get to Japan and find a hotel to stay at. Alistair takes them to a library where they encounter their cousins, the Holts, and are taken to a railway station where they are forced to search on the tracks for the next clue. Amy’s foot is stuck under a part of the railroad track and Dan tries to pull her out but they find that there is a secret compartment and they investigate. They have also made an alliance with their other cousins Ian and Natalie Kabra who promised to help them. Will they keep it up or will one of them break their alliance? I think this is a very enjoyable and humorous book. For example when Dan and Amy found the overlay (a shaped page) the letters t-o-o-t-a were written on the bottom of the page, Amy says, it’s Toyota. “The letters. They spell Toyota without the y.” Dan replies with a wry comment, “Great Amy. Our next clue is buried in a Sienna minivan.” I liked how the author put a lot of action in the main storyline. The best examples of the action are when Dan, Amy and Alastair are followed into the market by ninjas in taxis. Overall this is a great book for anyone 7 or older to read and enjoy. If you are interested in purchasing The Sword Thief from Amazon.com, please click the button to the right. First Clue Mysteries is pleased to provide information on over 100 mystery series for children and young adults. Each series is conveniently listed under four different age categories: New Sleuths (ages 4 to 6), Future Sleuths (ages 7 to 10), Sleuths in Training (ages 10 to 12), and Apprentice Sleuths (ages 13 and older). If you have a favorite mystery series you'd like to see added to our site, please contact us.